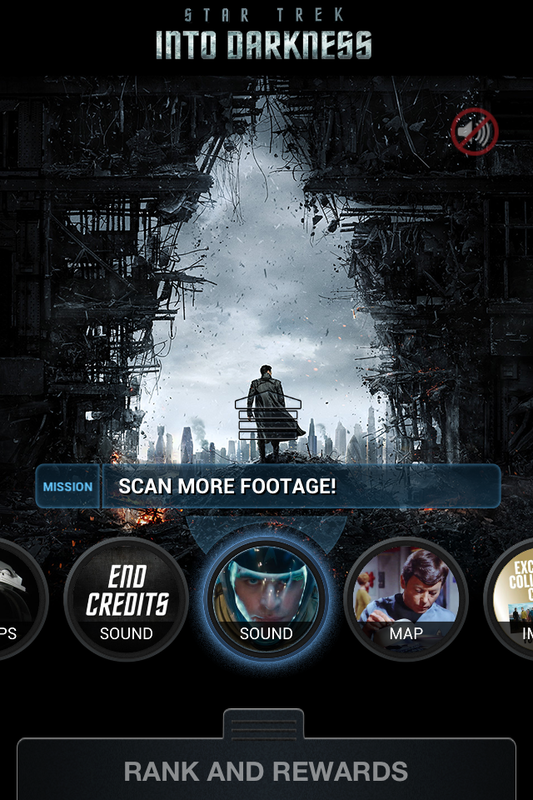 What is the new Star Trek Into Darkness movie app like? Over the past couple months, I’ve become familiar with third party TV and movie apps, like GetGlue and Viggle, but with the upcoming release of Star Trek, I wanted to learn more about movie companion applications. 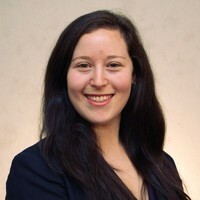 I took some time to get to know the new app. 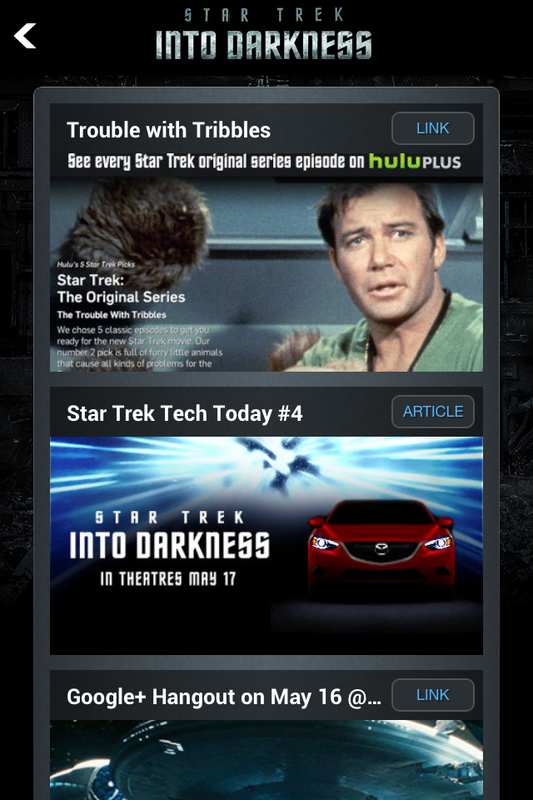 The Star Trek Into Darkness movie app, as a way to promote the upcoming release of the movie, gets users to interact with the Star Trek Facebook page, as well as the original Star Trek TV episodes. It is essentially a virtual scavenger hunt, dragging you around the web to uncover exclusives and behind-the-scenes content. Every time you interact with the application – scan a photo, listen for audio and more – you earn points, which brings you higher up in rank. The rank system is exactly like it is in Star Trek: New Recruit, Cadet, Crewman, and so on. Additionally, you can take quizzes and answer poll questions to test your knowledge of Star Trek history and Starfleet rules and regulations, which also gets you points. You do have the ability to “skip” a mission, if you are unable to complete it, or like me, you’ve spent too much time searching for a video that you just can’t find. The app also forces you to interact with the 2009 movie, so if you hadn’t planned on re-watching it before going to see Into Darkness, this is a good excuse. The app also streams news and exclusives to keep you up-to-date on what’s happening behind the scenes. Or it says it does. In reality, the “news” button just shows short links to sponsors and partners of the app and the movie, like Hulu Plus and Mazda (although you can get a free month of Hulu Plus through the app if you don’t already subscribe). The further you get in rank, the more of a scavenger hunt the game becomes. You have to dig harder and look in more places for content if you want to earn points. Content is no longer just on the Star Trek Facebook page, or on their partner sites. For some, this would pose as a turn off. After getting to Captain, the only missions I have left to accomplish is to physically go to locations (Seatle Space Needle, Hollywood walk of stars) to complete the game. Right now, it doesn’t seem as if there is an end in sight. The dedicated Trekkie would keep on to earn the rewards to finish the game and see what’s in store for them at the end. For the Trekkie, this is a great companion application. It matches the level of interest most Trekkies have in the series, as it integrates the original series with the upcoming movie release. However, for the casual observer, I don’t believe this will maintain interest over an extended period of time.